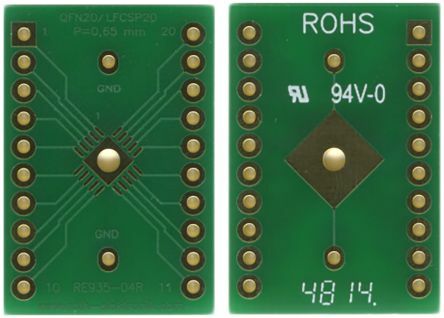 Adaption circuit board for DFN10 and eMSOP10 with 0.50 mm pitchEpoxy fibre-glass FR4 1.50 mmDouble-sided 35 μm CuPlated through holes (PTH)Surface chem. Ni/AuSolder stop maskHole spacing 2.54 mmShield pad and cooling pad. Adaption circuit board for QFN20 & LFCSP20 (0.65 mm pitch)Epoxy fibre-glass FR4 1.50 mmDouble-sided 35 μm CuPlated through holes (PTH)Surface chem. 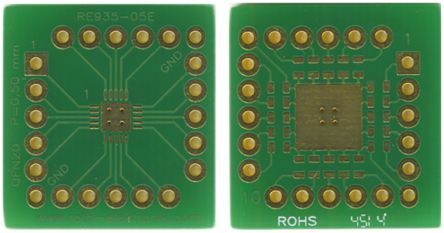 Ni/AuSolder stop maskHole spacing 2.54 mmFits on sockets with a distance of 15.24 mmShield pad and cooling field.